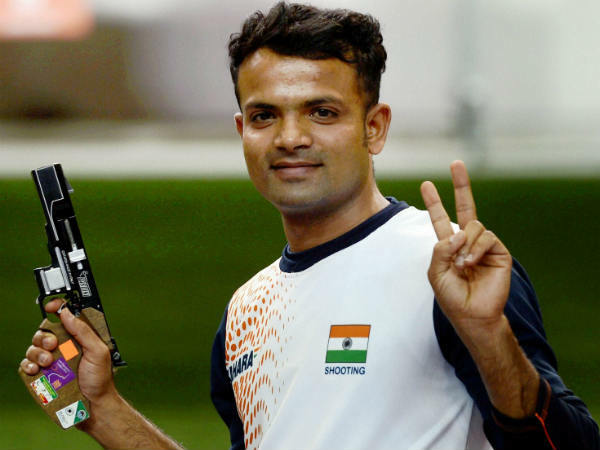 Vijay Kumar claimed gold in the Men’s 25m Centre Fire Pistol at the 16th Kumar Surendra Singh Memorial Shooting Championship in Thiruvananthapuram on Thursday. The Olympic silver medallist shot 583 to beat Pemba Tamang by one point while Pramod Gaikwad took the bronze, two points ahead of Samaresh Jung. Satyendra Singh beat Rahul Poonia for the bronze, while qualification leader Swapnil Kusale (1158) finished fifth. Men’s 25m Centre Fire Pistol: 1. Vijay Kumar 583; 2. Pemba Tamang 582; 3. Prmod Ramchandra Gaikwad 582. Team: 1. Army 1734; 2. BSF 1719; 3. Navy 1694. Junior Men’s 25m Centre Fire Pistol: 1. Arjun Das 571; 2. Rushiraj Atul Barot 563 (13x); 3. Anhad Jawanda 563 (11x). Men’s 50m Rifle Three Positions: 1. Kapil Rana 452.2 (1149); 2. Deepak Kumar 446.4 (1154); 3. Satyendra Singh 438.9 (1149). Team: 1. Air Force 3440; 2. Army 3426; 3. Navy 3423. Juniors Men’s 50m Rifle Three Positions: 1. Suhankar Pramanick 1122; 2. Syed Arab Parvez 1118; 3. Yash Padloskar 1108.